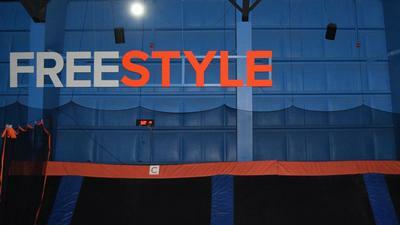 News | Family Christian Center creates immersive Sky Zone® experience with Electro-Voice | Electro-Voice | ESA Communications Ltd.
Best known as a great-sounding portable system, the durable Electro-Voice ELX200-10 also features three mounting points for forged eyebolts, making it a perfect fit for the nonstop action in Sky Zone. A total of 14 are flown as stereo pairs, focused within the various attractions to minimize volume in common areas in between. The facility uses an easy-access Web-based IP control platform accessible by laptop, tablet or smart phone to route up to six sources across eight audio zones. To kick the experience up another notch, Higher Standard added compact, high-power subwoofers to the mix, including two each of ELX200-18S, EKX-15S and ELX200-12S to fit under decks, in corners and other tight spaces. Two of Dynacord’s new L Series amplifiers power the subwoofers, one L1800FD and one L1300FD, both of which feature advanced DSP and FIR-Drive to ensure optimal loudspeaker performance. Three Electro-Voice PA4150 4-channel amplifiers drive the ELX200-10 speakers. #27 – 2861 Sherwood Heights Dr.
© Esa Communications Ltd. - Website Developed by Capital IT, Inc.